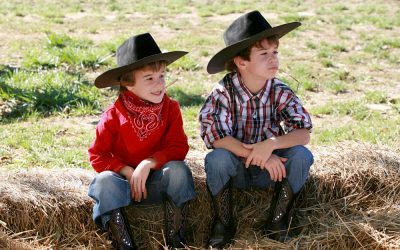 The Australian outback hats are great alternative option for you if you are kind of the American cowboy hat, but still love to wear it. The outback hat is the Aussie style cowboy hat of the American counterpart. 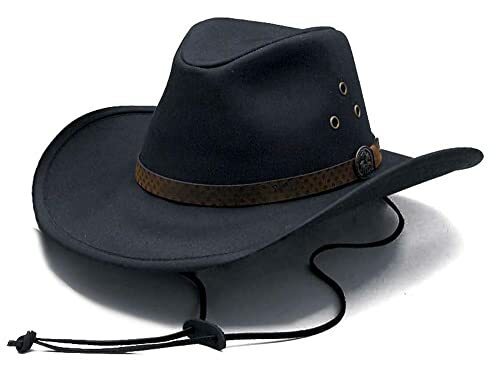 The brim of the outback hat is just like the cowboy hat with the brim slightly curving upward. However, the crown is quite different as it takes after the crown of the safari hat. 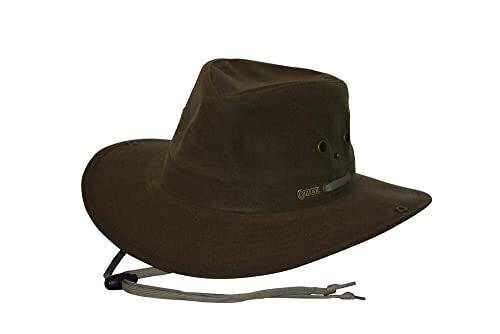 There are many kinds of outback hats that you can find on the market- they are different in the shape of the brim, the materials, and the colors. 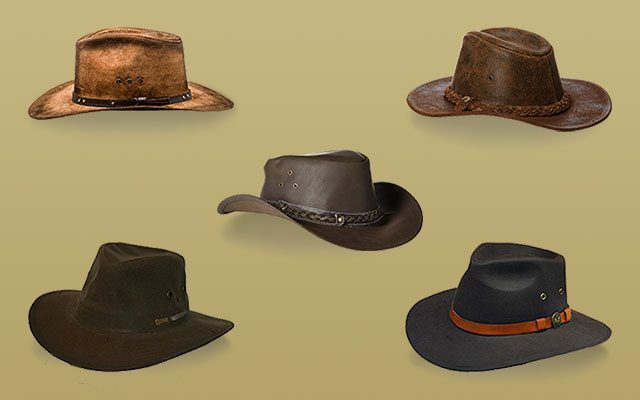 With thousands of choices of outback hats on the market, choosing the one which is the most suitable for you is never an easy task. 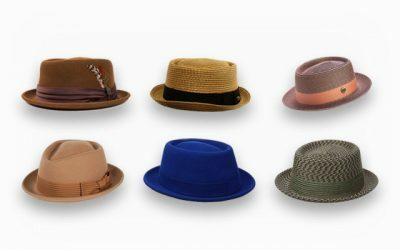 If you are looking for such a hat to add to your wardrobe, take a look at the review below for the high-quality and stylish outback hats for you in 2018. 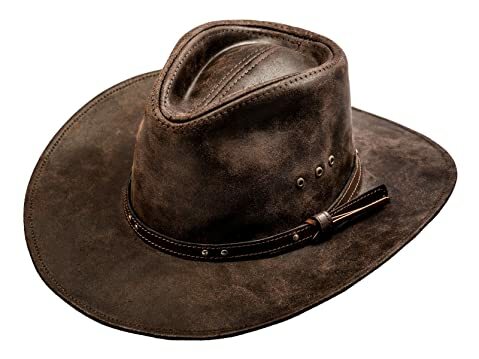 This outback hat is made of 100 % of full grain leather. It features low crown, a flat 2.5 inch brim, and a braided band. This hat has the traditional style of the outback hat with a distressed texture that will bring you a unique and vintage look that you desire. With its vintage look, this outback hat will be paired nicely with a pair of boots and washed Jeans. In addition, this hat is made of the high quality leather, which is soft and smooth. High quality leather is also one of the toughest types of material that you can find on the market. Hence, you can be rest assured that this leather outback hat is tough and durable which will age nicely over time. Another thing about the material of this hat is that it is crushable so that you can easily pack the hat to your bag for carrying it around – and when you take the hat out, it will spring back to its original shape. Last but not least, the hat has a quick drying performance so you can enjoy wearing this hat when it is rainy or snowy outside. While the brim of this hat is flat, the outer of the brim doesn’t have an inner wire. 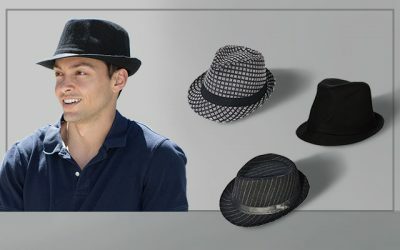 So, this hat might not be a good option for you if you want a hat that you can reshape the brim of the hat to the style that you want. Also, the brim of this outback hat might become floppy and hence, block your view when you stand against a strong wind. 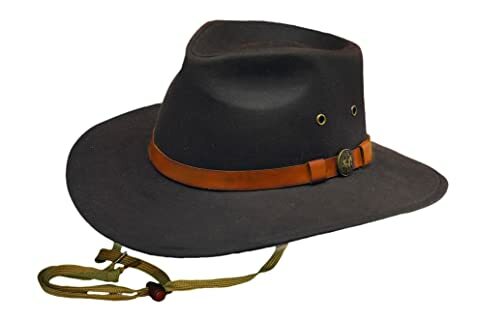 This outback hat is made of 100 % of leather with the leather hat band and a chin cord. The width of the brim is 3 inches and the height of the crown is 4 inches. First of all, this hat is made with the 50 + UPF rated material. Hence, it is able to protect your skin well from the harsh sun rays. In addition, the brim is wide enough to provide a lot of shade for your face, your ears, and your neck. The brim of this hat comes with an inner wire around the outer edge of the brim so that you can easily reshape the brim to the shape that you like to. While the hat is made of the breathable material, it also has 3 eyelets in the crown to help flow air, making it even well-ventilated to keep your head cool all of the time, even in a hot summer day. Besides the breathability of the hat, it is also waterproof to the oil skin. You can enjoy wearing this hat outside when it is slightly raining without worrying that you will damage the quality of the hat. Overall, this outback hat is one of the best options for you to wear outside, especially when you go hiking or camping. It is waterproof, it is protective. 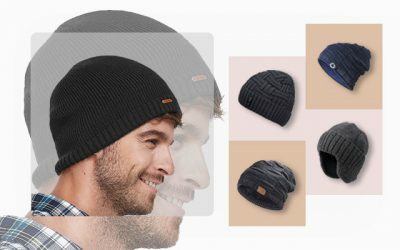 It is also wind proof thanks to the soft and comfortable chin cord to help secure the hat on your head all of the time. Also, the brim of this hat can stay firm and sturdy in high winds so it will not block your view at all. In case you are looking for outback straw hats to wear to the beach, a party, or a music summer camp, there are many choices of this hat with different colors for you to choose from. This outback hat is made of straw material with the classic style of the cattlemen hat. The thing that I love the most about this hat is that it comes with an elastic hatband. The hatband is very stretchy and flexible so that you can find a perfect and comfortable fit with this hat easily. In addition, the headband is made of the premium cotton material to be very soft and breathable. It can also help to wick moisture away to keep your head cool all of the time, even in the hottest summer days. Besides the quality elastic headband, this hat is made of the high-quality material which is soft and breathable. It also makes the hat very lightweight and comfortable to wear as well. Not to mention that the brim and the crown of this hat are both well made for a sturdy and solid construction. One thing that I don’t love about this hat is that it is not foldable. However, this is quite understandable given the fact that this hat is made from straw. In exchange, you have a strong and sturdy hat which will not deform easily. Also, while this hat comes with an elastic hatband, it is suitable for people with small to medium sizes of heads. If you have big head, you should look for other options on the market. 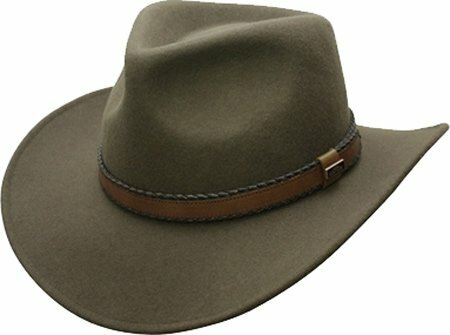 This tilley outback hat is made of 100 % of cotton. The fabric is certified UPF 50+, the highest given. As a result, you would be able to have the ultimate protection against the harsh sun rays. There are many things that I love about this hat. The first thing is the washable material. 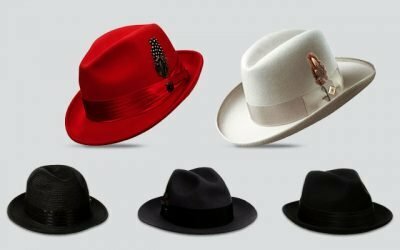 While many other hats are made of leather or straw, which you need to wash by hand in order to maintain the quality and the shape of the hat, you can wash this hat with a washing machine. Thanks to the synthetic wax finish, which is a double pass of wax, the hat can stand up to washings for several times and still look like new- a nice feature for a busy person like me. The second thing that I love about this hat is its design. It has the front and the back wind cord systems to help secure the hat even in the strong winds. I also like the look of the brown band without the tie down cord showing outside of the hat. In addition, this hat is made with the hydrofil sweatband. The sweatband is of high-quality material which is capable of wicking moisture away and keeps your head cool all of the time. Not to mention that the hat comes with the grommets for extra ventilation and for the air to flow more freely. Many people think that this hat runs a little bit smaller than other outback hats that you can find on the market. You should take this into consideration when choosing the right size for the hat. I also wish this outback hat has more color variety for me to choose from. There are 3 options of colors for you to choose from including dark brown, brown, and black. 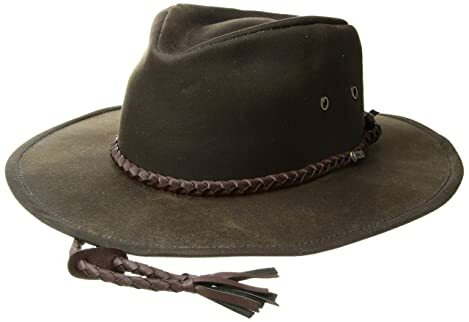 This outback hat is made of the genuine leather. The width of the brim is 3.15 inches and the height of the crown is 5.1 inches. First of all, this outback hat is one of the well-made hats that you can find on the market. The hat is sewn nicely and evenly with the natural high-quality cowhide. All of the details are sharp and carefully made. The quality is also of the top-notch quality which is tough and durable, which is weather resistant. Second of all, if you like modeling your hat, this one is for you. With the elastic metal wire in the edge of the incurved brim, you can easily reshape the brim to the style that you like. In addition, the wired brim will prevent the brim from becoming floppy in case of a high wind. Last but not least, the crown of this outback hat has ventilation eyelets, which makes the hat become even more breathable and well-ventilated in a hot summer day. 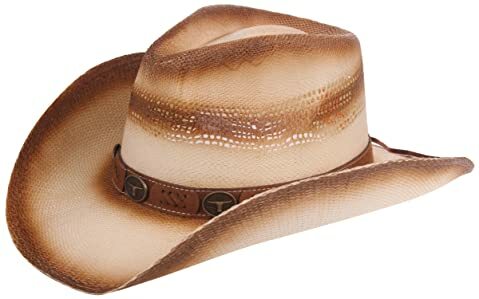 This outback hat is suitable for anyone who is looking for a classic western cowboy hat which is casual and of free style. You can wear this hat when you hang out with your friends or when you come to a Western themed party. This leather hat is made of 100 % of the buffalo hide. The width of the brim is 2.75 inches while the height of the crown is 3.75 inches. There are 2 options of colors, including brown and black, for you to choose from. This leather outback hat is made from one of the toughest types of materials. It is rated UPF 50 + for its optimum protection against the harsh sun rays. While the material of this hat makes it thick, the hat is still lightweight and comfortable to wear. And thanks to the ventilation eyelets, the hat is also very cool and breathable to stay in your head for a long time. 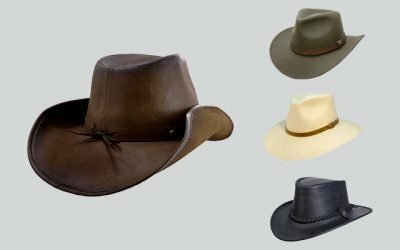 Like some of the high-quality leather outback hats on the list, this hat is crushable and can easily spring back to its original form after it is crushed. 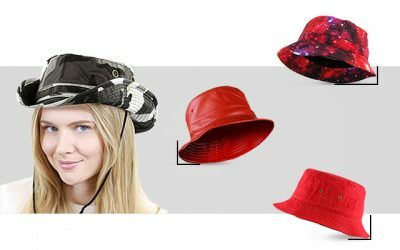 In addition, the brim of the hat can be easily reshaped and remodelling, offering you many chances to adjust the hat to the style that you want. This outback hat is water resistant and weather proof with its high quality buffalo hid which is treated with waxes and oils to protect the hat from the harmful elements. 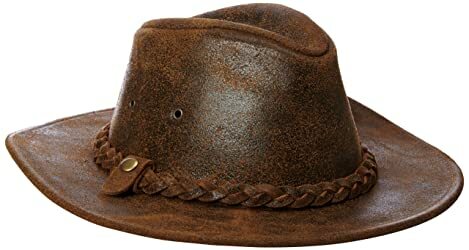 Also, with the waxes material, this hat does have a certain weathered and rugged look that you are looking for in a cowboy hat. And with such characterisistics, this hat will age nicely. This hat is made of the leather which is treated with wax and oil. The braided hatband of this hat is also made from leather with a leather chin cord. The height of the crown is 4.25 inches while the width of the brim is 3 inches. Enjoy the tapered pinched crease crown with a wired brim which is shapeable for you to adjust to the look that you like. This hat is definitely one of the most suitable outback hat for you to wear when you go out- in all seasons and types of weather. First of all, this hat is nicely waxed with a layer of protection. As a result, it is water resistant and has a quick drying performance. You can easily wear this hat when it is rainy or snowy. In addition, this hat comes with an adjustable chin cord which keeps the hat to stay secure on your head regardless of the wind. You are also protected from the sun rays as well thanks to the fabric which is rated 50 + UPF. How about the season? Well, this hat is made of the real leather with a thick body, which is warm enough to help your head maintain a certain temperature in the mild winter days. In addition, this hat is designed with ventilation eyelets to help regulate air and make sure it is breathable and well ventilated for your head in hot summer days. Moreover, this hat is made with an excellent craftsmanship for rugged details and a sturdy construction. 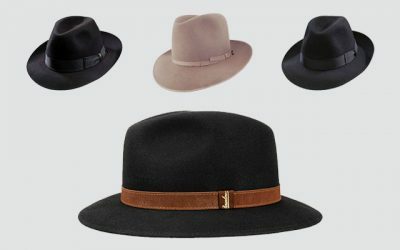 All of these features make this outback hat look classy and expensive. This out back hat is made of 100 % of wool blended with organic cotton. Besides the traditional black or brown color, this hat is available in Loden green as well. It comes with an organic cotton inner pouch. Provided that you are looking for a versatile men’s outback hat with a simple and traditional style, this hat is your ideal option. While it simple in style, it is definitely not made of cheap material. In fact, this hat is made of the premium quality wool and organic cotton material. They are soft and comfortable to wear on your head. In addition, these materials are also warm to wear in a windy or cold winter day. Last but not least, they are durable and will ensure the long shelf life of the hat. Besides the high quality materials for the body of the hat, this hat is made with the organic cotton sweatband. The sweatband is therefore very soft and well-ventilated. It will not cause any itchiness or irritation even when you have to wear the hat for a long time. The only problem I have with this hat is that it is slightly more expensive than the other outback hats that you can find on the market. 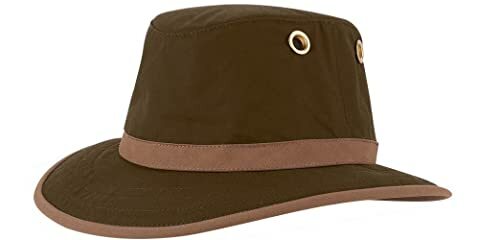 Still, the price is reasonable given the quality and fashionable look that this outback hat would offer you for many years to come. This outback trading Kodiak hat belongs to the Oilskin collection of Outback trading. It is made of cotton with 3 options of colors for you to choose from including brown, field tan, and black. It also features an adjustable shoestring chin strap. The high quality cotton material makes this hat very soft, lightweight and comfortable. Not to mention that it can be folded easily, making it more convenient for you to bring it around. Another advantage of this high quality material is that it is waterproof so that you can easily wear it when it is rainy or to take part in a lot of activities including riding, hiking, and fishing. The brim of this hat is pretty wide, which is enough to cover your face as well as your ears and neck. Also, you can reshape the brim of the hat to the shape that you want as well. And with the wired construction, the brim will not become floppy in case of a big wind. Besides the breathable material, this hat is made with the Comfortemp sweatband which is highly capable of wicking moisture away and keeping your head as cool as possible. In addition, there are several eyelets on the crown of the hat to help keep the air flow free and make the hat even more breathable. The last thing that I love about this hat is that it is easy to clean both by hand or with the washing machine. You also don’t have to take too much care for this hat for it to last for a long time. Indeed, it is a rough and heavy duty outback hat. This outback hat is made of 100 % of cotton with a 4 inch crown and a 2.75 inch brim. There are 3 options of colors for you to choose from including brown, field tan, and sage. Like any other high quality outback hats, the fabric of this hat has the UPF rating of 50 + so that you can enjoy wearing the hat under the sun. 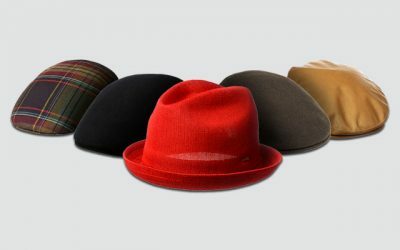 Besides the premium fabric which is protective and durable, the hat is made with the skillful craftsmanship for a firm and sturdy construction. It comes with the waterproof oilskin for you to wear it under the rain or when you go fishing. Furthermore, it has the screened eyelets to make sure the hat is as breathable and well-ventilated like any other premium outback hats to wear in the summer. The marine-style chin cord that can be made to fit tightly at the back of the head as well as under the chin. It is also easily adjustable for you to find the perfect and most comfortable fit. While the brim can become floppy in case of a high wind, you can easily snap up the brim to make sure that it will not block your view. It also helps to bring a new style and look to your outback hat. 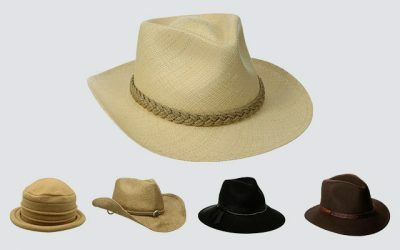 Here is the list of some of the best outback hats that you can find on the market. As you can see, some of them are made from straw while some are made from leather or felt material. They are also different colors and designs. 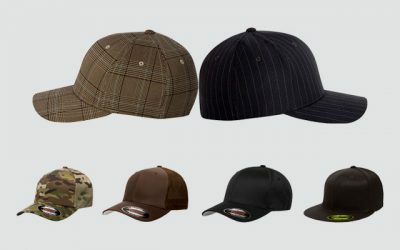 Some of the outback hats are suitable to wear to a party, to a music event or to go camping and hiking. Some are more formal and some are more casual. Make sure you read the reviews of the outback hats before you decide to buy one. This will help you find the one which is of high-quality material and durability. 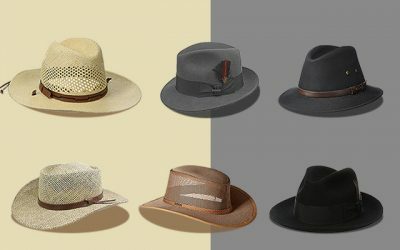 As long as you spend time researching and thinking about your own needs, you will be able to buy the best outback hats for men and have a worthy investment. Nice hat, it’s size is a little bit snug, but it can be stretched to form to your head. It is a stiff hat but will loose up over time. Damp with hot soaked rag, wring it out and place inside of crown. Let the headband get soaked for a few minutes, and place it on your head and wear it for a couple of hours. If needed, repeat it. It will become comfortable.